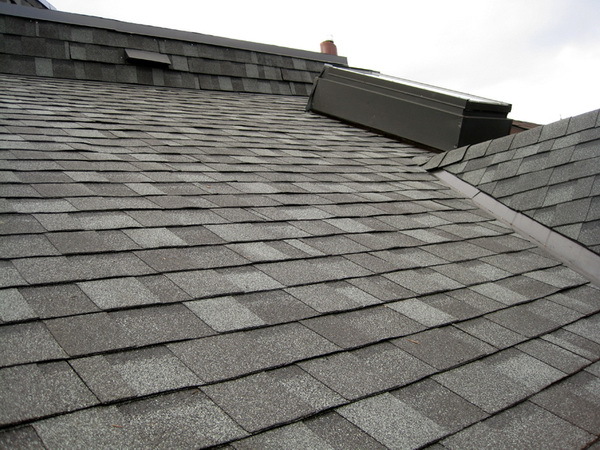 Asphalt shingles are the most common roofing material used in Canada today and also generally the least expensive. Standard asphalt shingles can last from 12 to 20 years, depending on a type and work for a variety of roof and architectural styles. With asphalt you have a large array of weights, colors, durability levels, styles, sizes and designs to choose from. 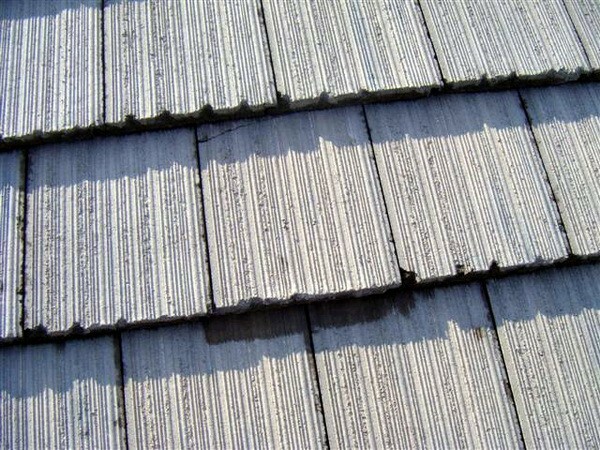 These shingles are vulnerable to wind and ice damage, subject to mildew and moss and they are available in paper-based (felt) organic or fiberglass. Lighter-colored asphalt shingles reduce cooling costs but the words "asphalt shingle" and "eco-friendly" are rarely used together. 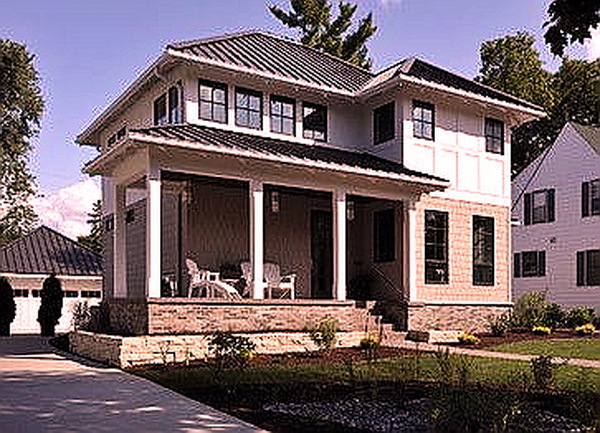 In some instances you can use recycled asphalt shingles to make your installation more environmentally-friendly. 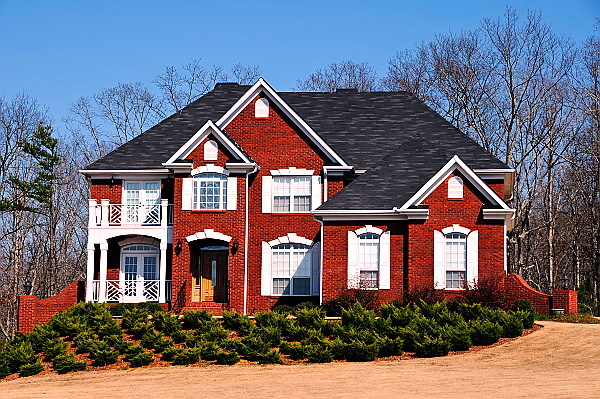 Another type of asphalt roofing that gives your home a little more character is the architectural shingles. These shingles are higher quality than your standard composite asphalt shingles and give you an aesthetically pleasing look with more durability than standard composite shingles can provide. The major difference between architectural shingles and standard shingles is their three dimensional appearance giving you the ability to mimic expensive roofing options such as cedar shakes and slate but without the hefty price tag of either of those roof types. 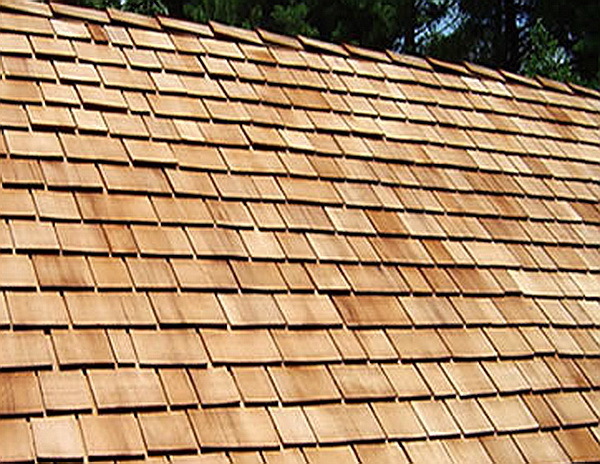 Characteristically made from Western Red Cedar and sometimes cypress, pine or even redwood, wood shakes and shingles offer a high resistance to rot and if properly maintained and cared for, can last from 30 to 50 years or more. Wood shingles or shakes have a natural appearance and blend in with the environment which makes them a first-class choice for numerous architectural styles and locales. Many wood shakes and shingles today are treated with fire retardants and chemical preservatives which increase the material's resistance to fire as well as to early rot or decay depending upon your climate. 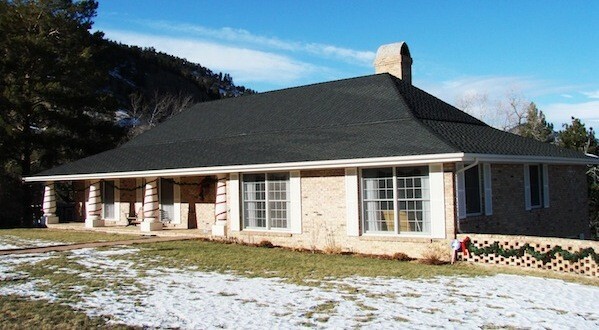 These shakes/shingles resist moisture and are a renewable resource. One of the great beauties of a wood roof is that no two installations will ever look exactly the same due to color variations and cuts as well as thickness to the shake or shingle. 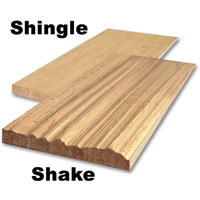 Shingles are machine-sawn while shakes are hand or machine split and can appear more rustic. The lifetime of a wood roof is shorter than many other roofing materials and this roof requires proper care and maintenance to fulfill its life expectancy. 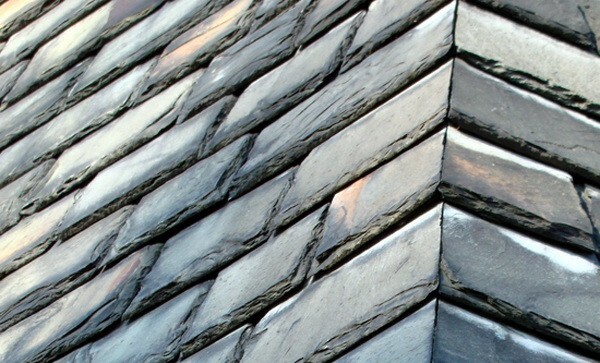 Slate roofs are actually roofs made of natural rock that are made to mimic shingles. 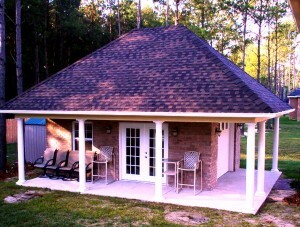 Slate roofs are one of the most natural looking roofs and are available in a wide variety of natural colors. 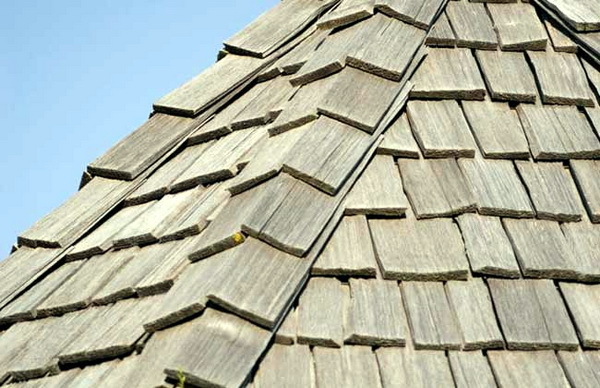 Known for its incredible durability, slate roofs can last for more than 75 years. 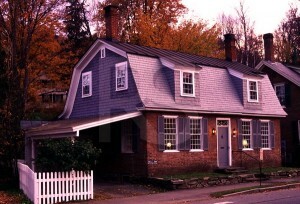 There are even some slate roofs that have been known to be around for a few centuries. The downside to slate roofing is its high price tag which is partly to do its heavy weight, causing the need for special installation, but its many advantages outweigh these few disadvantages. Fireproof – Slate roofing is made from a metamorphic rock that is formed under extreme temperatures – which gives it its fireproof tendencies. 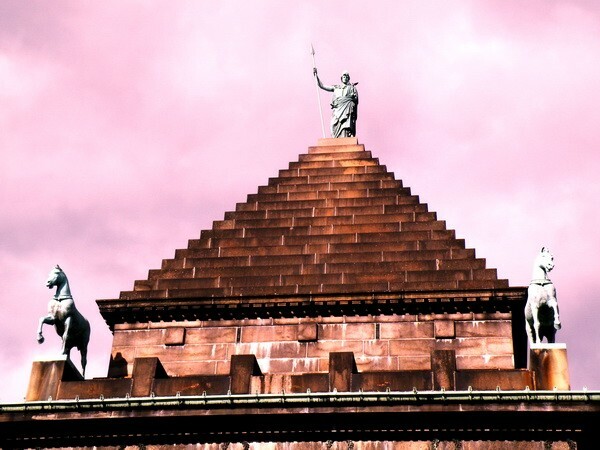 Weatherproof – There is no other material that is as durable as stone. Because slate roofing is so strong it can withstand harsh winds, extreme heat, freezing temperatures and anything else that Mother Nature can throw at it without any damage. Aesthetically Pleasing – Slate roofs are extremely attractive and are typically found on more expensive homes because of its natural beauty. Added Value – Anytime you make an improvement to your home you potentially increase its value, but adding a slate roof immensely improves your home’s value because of its expensive nature as well as its aesthetic appeal. Cost Effective – Because a slate roof has such a long life as well as durability, there is not a lot of need for maintenance, making the slate roof cost effective. There will not be a need to replace the roof in 10 to 20 years as is standard for many other roofs. 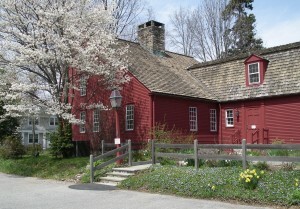 Many Colors – Despite the fact that slate roofing is natural, it is available in a wide variety of natural colors and styles that are all unique. 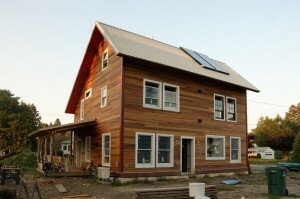 Green – Since slate is 100% natural, it has many green properties including lowering your utility bills due to needing your heat or air condition much less, uses no substances that are harmful to the environment and it keeps other roofing materials out of the landfills because slate roofs do not need to be replaced often. Clay tile is considered a lifetime roof; in fact, it will often outlive the decking it's built on (100 yrs or more). Overlapping or interlocking, clay tile is now created by baking (firing) molded clay into tile in a high-temperature kiln. Traditionally, clay tile was formed by hand. Today's clay tile can be curved or flat, color-glazed or even have a variety of surface textures applied offering consumers a wide array of looks to choose from. Benefits to this type of roofing material include life-span, its low maintenance requirements and fire-protection. 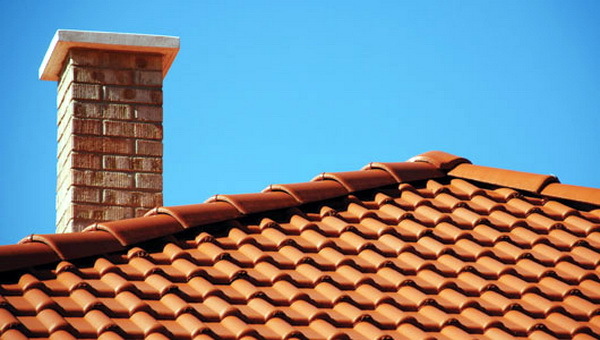 Clay tile is more expensive than some of the other roofing materials available but its beauty and natural appearance often outweigh the cost for homeowners looking for an attractive roofing material to enhance their property. Tile is a very heavy material which may necessitate extra roof support and extra cost. This material is also quite breakable and can chip and so walking on the tiles should be left to professionals. 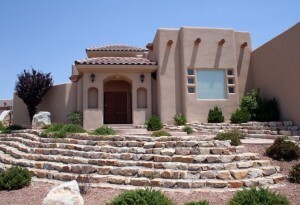 Flat styles of clay tile are often used to create French and English looks while curved styles are used for Mission or Spanish-style old world European looks as well as Southwestern looks. 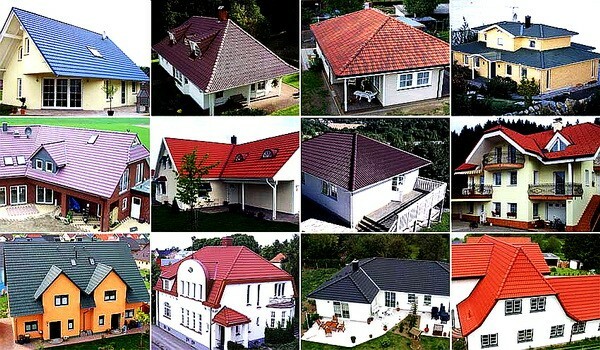 Clay tiles are one of the most versatile and eye-catching roofing materials available on the market today. Concrete tile is generally composed of cement, sand and water and this material comes in a variety of finishes, colors and styles as well as cuts and shapes - from shingles to shakes and clay to slate-lookalikes. 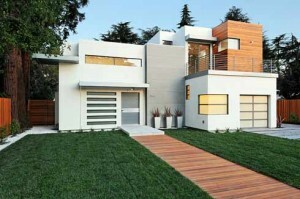 Concrete is an excellent choice for a long lifespan (30-40 years), low maintenance and durability. Normally a Class A Fire-Rated roofing system, concrete tile is durable enough to walk on, energy-efficient and a natural insulation to noise. 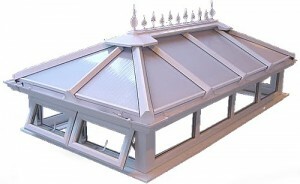 It's simply the best, and very often the only way of protecting your slightly sloped roofs. Considered the least beautiful material, even in comparison with shingles and other roofing types. Low cost. However, prices may not be the same for different types that vary in strength, color and design. Some varieties offer lifetime guarantee, which means no renovation and maintenance costs. Durable enough to last around 30 to 40 years with minimum maintenance. Easy installation. It can withstand cutting, drilling, punching, sawing and nailing. It can be easily bent, so as to fit the frames. It can also be installed over existing roofs. 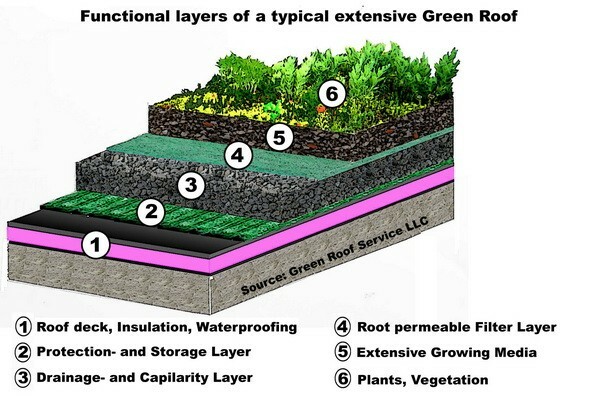 Some of the modern versions of these fiberglass roofing sheets have anti-algae properties too. 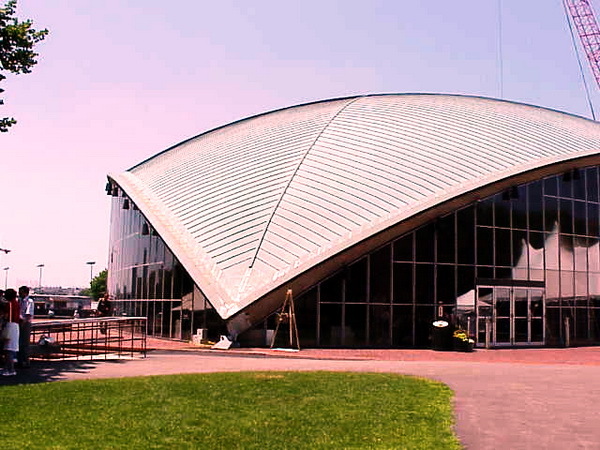 Corrugated fiberglass roofing is also more fire resistant than materials like felt and wood. It is also resistant to corrosion and rot. 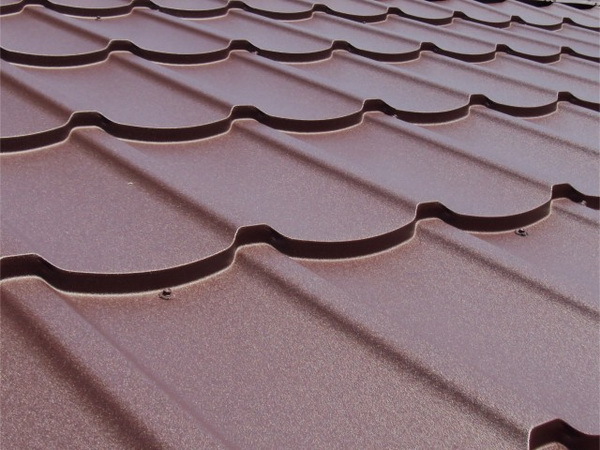 If properly installed, this roofing material can also withstand rough weather. It is also resilient and can return to normal shape, even if they sustain deflections with normal load. This cannot be seen in certain other types of roofing sheets (like metal ones) that may not return to normal shape after deflections. Can create a disturbing noise during rains. 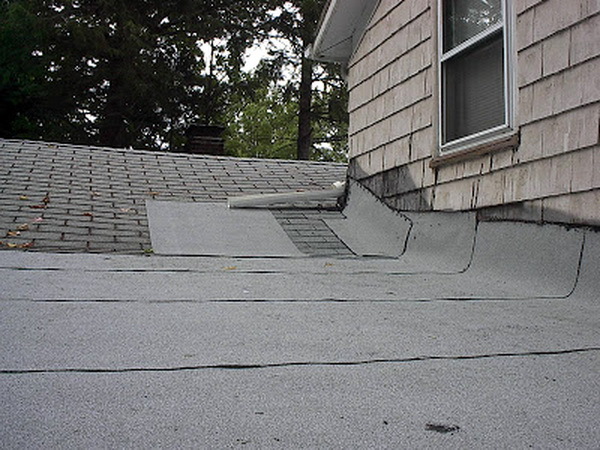 Fiberglass roofing material is not recommended in areas prone to high winds. Offer little insulation from extreme heat and cold. Fluctuations in temperature can cause expansion and contraction of corrugated fiberglass roofing. Though they are shatter resistant, corrugated fiberglass sheets may crack, if any heavy objects fall on them. Metal roofs aren't what they used to be. 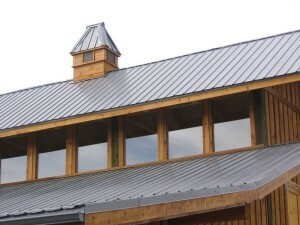 If you're thinking back to the old barn roofs of years past that used tin, strike that vision from your mind because today's metal roofs are light years ahead of those. 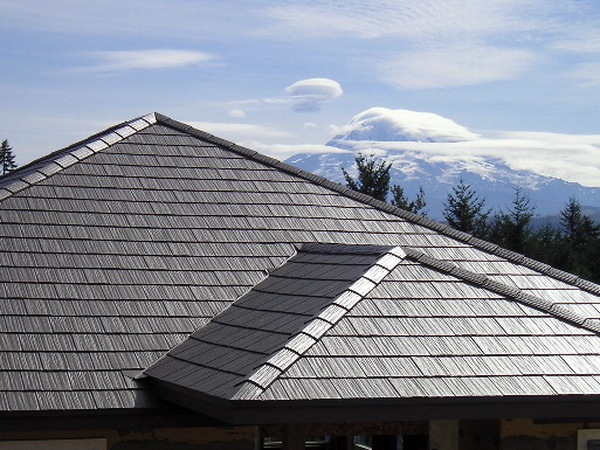 Fully recyclable, metal roofing materials come in steel, aluminum copper and alloy strips with steel holding the most popular spot with consumers. 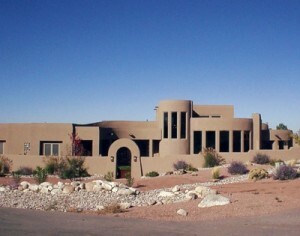 It is not uncommon this days for the offer to be faxed, or more often e-mailed to the listing agent. In my firm belief this not just shows the poor presentation of the buyer client bt might create complications in the offer negotiation process. Real estate transaction is not an event but rather the process of negotiation involving The Seller, represented by listing agent and The Buyer, represented by the buyer agent. 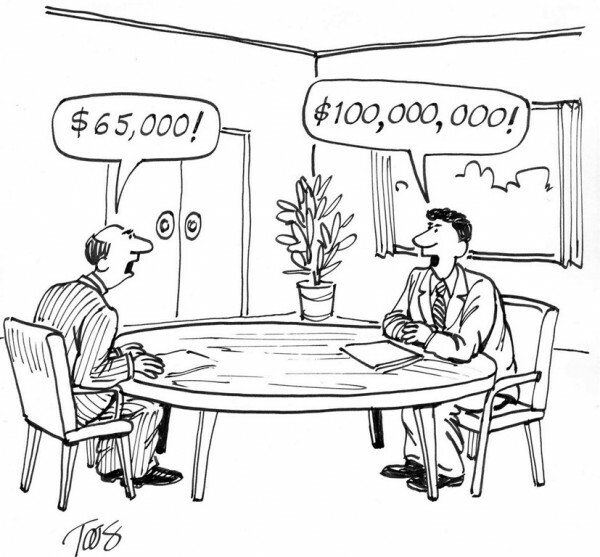 The success of the transaction will greatly depend on the success of the offer negotiation. 1. By presenting in person we eliminate a whole lot of possible confusion and misunderstanding. 3. By presenting in person we eliminate the chance of technology glitches - what can be worse then not getting the offer across on time and missing out? What can be more frustrating then receiving a completely illegible document? 4. By presenting in person we get the best case scenario of real people talking to real people. 5. By presenting in person we can get to the successful finale faster, in a more respectful way to all the parties. Want to know more? I am here to help, as well as my real-time web-site updated hourly with all the hot listings. Please, make sure the property you are buying is worth what you are paying for it, or at least has some potential - get your free market evaluation. Realtor.CA - Did You Know? Grow House Anyone? Help yourself - there is plenty around! Mr. and Mrs. Home Seller, please, Leave the Premises!!!! National Do-Not-Call-List - Do You Really Know What this is? Please, Don't Let the Cat Out - you gotta be kidding me! Handymen Gone Handless or possibly brainfree! Real Estate Agent with Sutton Group Summit Realty - selling with a smile! I get this question all the time - what is the difference? Ok, lets see! 4. You can not change the exterior without written permition of condo corp.
2. The value of your home will be relatively easy to estimate, based on the upgrades you have done. 4. Usually no additional amenities. Need to know more about Townhomes? What is Status Certificate and Why do you need it? 1. 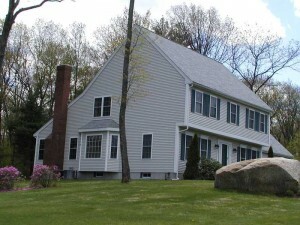 Listing agent is representing a SELLER. He's known Seller for quite some time, they established some sort of relationship and trust. And you are just walking through the door and trying to get a discounted price, guess what? 2. In a dual representation, listing agent will have to do double amount of work. And you think he will give you the buyer part of the commission. Guess what? 3. In 99% of cases when signing a listing agreement, listing agent will discuss the situation of multiple representation with the seller. If listing agent brings his own buyer, he will reduce the commission he is charging his seller. So, say instead of 5%, 3.5% commission would be charged. This is the money you are after right? But they don't exist - already given to the seller. 5. Statistics does not lie - unrepresented buyers, or buyers in the multiple representation quite often over pay or end up with less favourable conditions then when they are represented by a buyer agent. Have questions? I will be right here. And Happy Buying! My real-time web-site updated hourly with all the hot listings. Status Certificate Condition is one of the most commonly seen conditions on the Agreement of Purchase and Sale for Condominium. What is it and why is it important for the seller to preorder it and for the buyer to get to your solicitor for review before the purchase is finalized? The status certificate is a document, that provides basic and essential information concerning the financial status of a unit and of the condo corporation. Its main focus is to inform a prospective owner of the fees, of any large increase that is going to come into effect, of any special assessment that is being contemplated by the board, and any arrears or lien that a particular suite might have. In addition, it contains the condo declaration, by-laws, budget, reserve fund, insurance, management contract, rules, minutes of the last annual general meeting, and mention of any lawsuit involving the corporation. his certificate can run into one hundred pages. For the buyers: obtain status certificate before firming up the sale, you want to make sure, you are getting what you paid for. 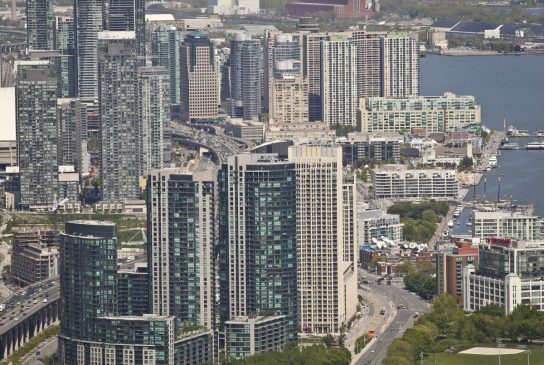 For the sellers: you might want to pre-order your status certificate before putting your condo on the market. It might take up to 10 days for the condo corporation to provide the requested document and you really don't want to be in limbo for additional 10 days once you have an offer on your home. Need to know more about Status Certificate? Red, yellow, white, blue, brown? Steel, wood, glass? Fancy or simple? 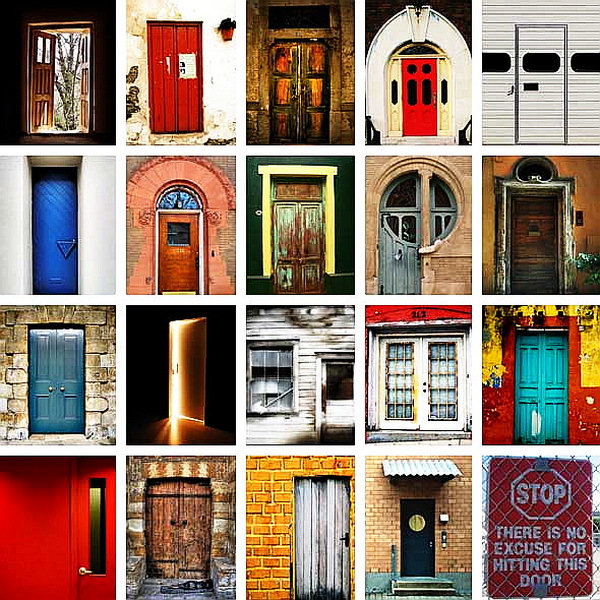 What type of door does your home have? And what is more important, does it serve its purpose to protect from heat and cold, pests and strangers? Does it also look welcoming to your friends or potential home buyers? Lets talk abut your DOORS! Doors typically consist of a panel that swings on hinges or that slides or spins inside of a space and is used to control the entry into the structure of people, animals, air and light. 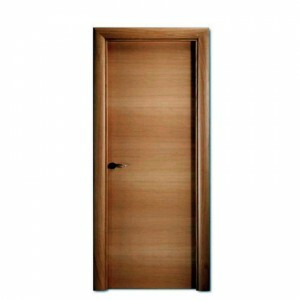 Doors are also very significant in preventing the spread of fire. They act as a barrier to noise. Many doors are equipped with locking mechanisms to allow entrance to certain people and keep out others. 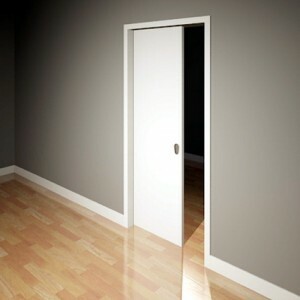 As a form of courtesy and civility, people knock before opening a door and entering a room. Doors are often symbolically endowed with ritual purposes, and the guarding or receiving of the keys to a door, or being granted access to a door can have special significance. 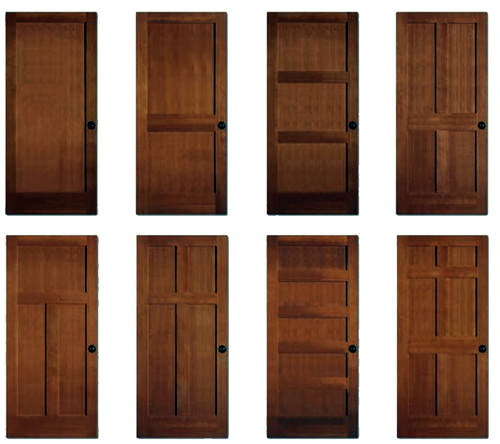 Many kinds of doors have specific names, depending on their purpose. 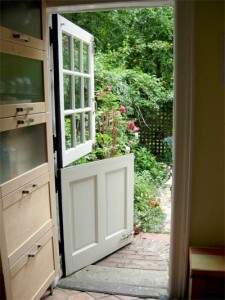 There could be interior and exterior doors, depending on where they installed. 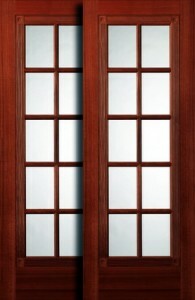 Depending on the type of door panel, doors could be single, French, Dutch. Depending on the mechanism used - sliding, hinged, roller, tilt. 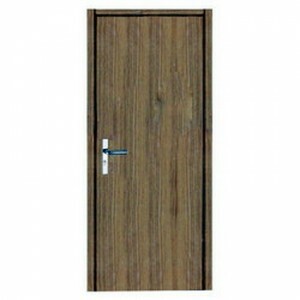 Hinged doors - the standard hinged door is as basic as doors come. 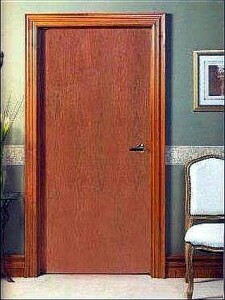 This is what everyone thinks of when you say the word ‘door’. A hinged door typically consists of either a solid wooden panel door or hollow-cored door affixed to a door jamb with two or more hinges. Additional hinges are generally required to support taller doors, and stronger, sturdier hinges are required for weightier doors. The door may have a knob or lever entry and be lockable or may simply be pushed or pulled open, depending on where it's installed and for what purpose. Self-closing door mechanisms are sometimes found attached to this type of door. 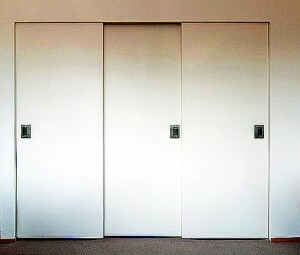 Another type of hinged, single leaf door, not smooth, but rather consisting of panels, as the picture above shows, you could have single-panel, double panel, triple-panel and so on. 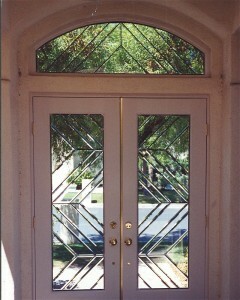 Door with glass or stained glass inserts. 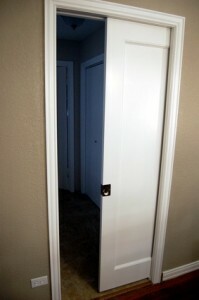 This is another type of hinged door, not the one you will see too often in our days. A French door is a door style consisting of a frame around one or more transparent and/or translucent panels (called lights or lites) that may be installed singly, in matching pairs, or even as series. 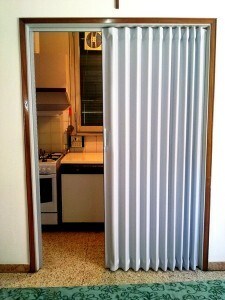 a door divided into two parts horizontally, allowing one half to be shut and the other left open. 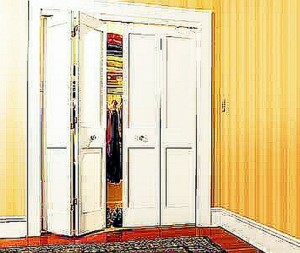 Sliding / Gliding Doors - a door drawn across an aperture on a groove or suspended from a track, rather than turning on hinges. 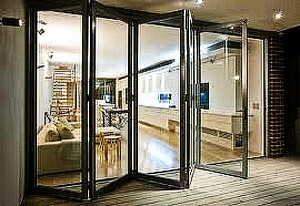 Sliding doors make excellent use of space, and allow significantly larger entryways than conventional hinged doors. 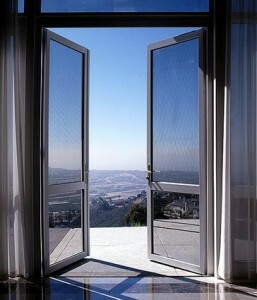 A bi-fold door consists of two panels attached by hinges, which folds in the middle when opened. A sliding glass door or patio door is a large glass window opening in a structure that provide door access from a room to the outdoors, fresh air, and natural light. 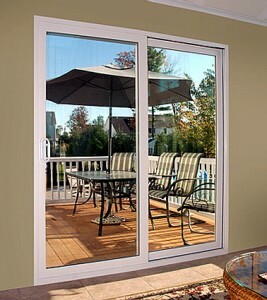 A sliding glass door is usually considered a single unit consisting of two panel sections, one being fixed and one a being mobile to slide open. 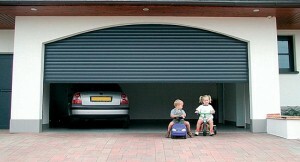 A roller door is a type door normally found in garages and sheds. Roller doors consist of a corrugated steel curtain that, when lifted to open, rolls up into a bundle at the top of the door. The corrugations in the door allow the door to flex - the wider the expanse the door has to cover, the deeper and sturdier the corrugations and steel have to be. This means a larger bundle must be accounted for when the door is fully open. 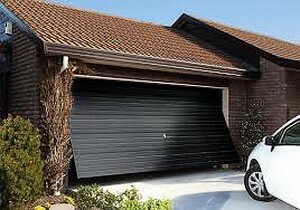 Other materials can be used in the construction of these doors where impact is not going to be an issue, but since these doors are by and large used in garages where a bump from a car is more likely to occur, the most commonly used material is steel. Hinged tilt doors are commonly used for garages and sheds, and offer a simple and cost-effective way to create a large, accessible opening. 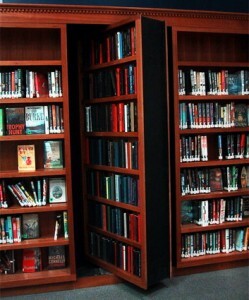 And my favorite type - Hidden Doors! 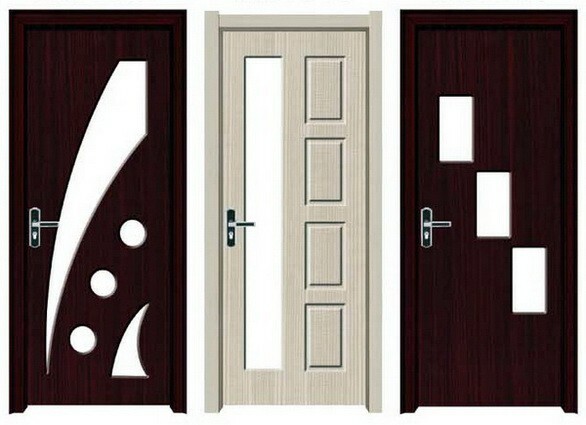 And what type of doors does your home have? I bet you more then one! 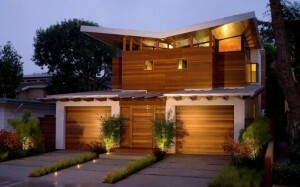 Would you agree that roof is one of the most important components of the house? 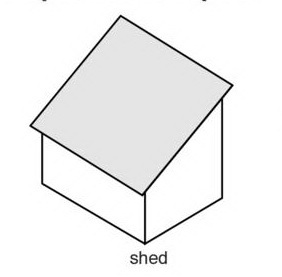 You can barely call a building structure "a house" when it has no roof. 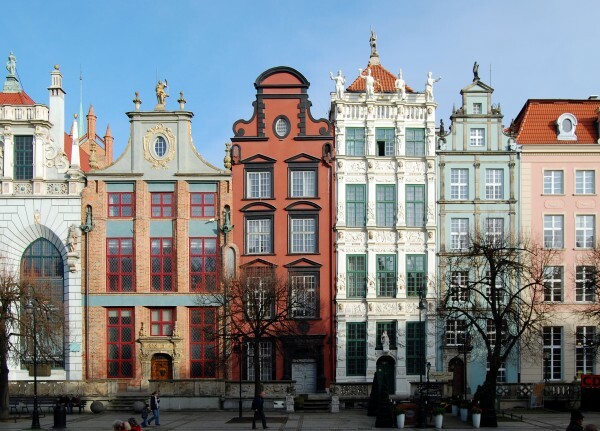 And of course, every architectural style has its own type and shape. 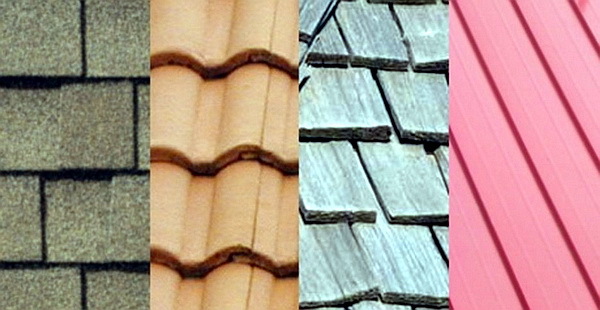 Do you know what type of the roof does your house have? There are two basic types - flat and sloped roofs. 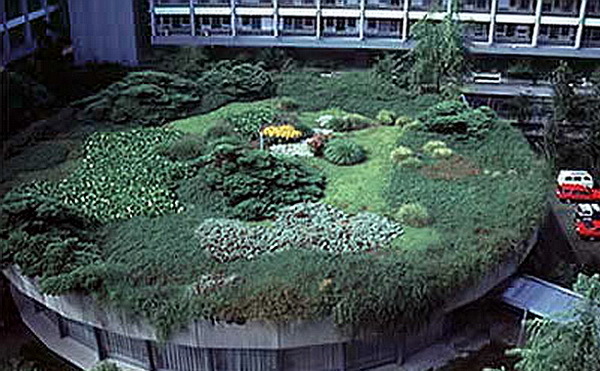 A flat roof is a type of covering for a building and it is exactly what it is called - flat. 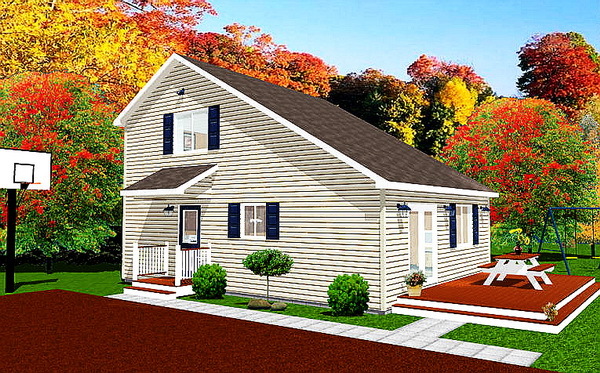 In contrast to the more sloped form of roof, a flat roof is horizontal or nearly horizontal. The slope of a roof is properly known as its pitch: Roofs which are nearly flat are known as low-pitch roofs (as the angle of slope increases, so the pitch is said to increase). 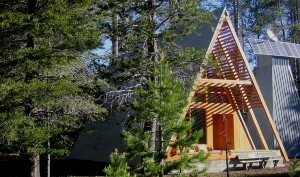 Gabled roofs are the kind young children typically draw. They have two sloping sides that come together at a ridge, creating end walls with a triangular extension, called a gable, at the top. 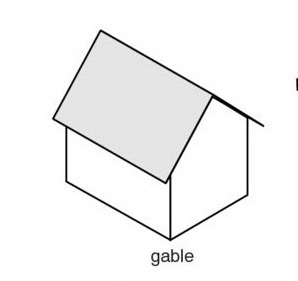 Similar to gable roof, but the two sides are not symmetrical. 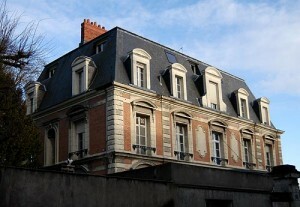 A French version of gable roof. 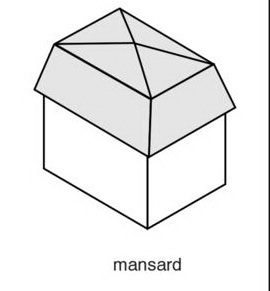 The difference is that the mansard roof has a flat area at the top instead of forming a perfect triangle. A hip roof or hipped roof, is a type of roof where all sides slope downwards to the walls, usually with a fairly gentle slope. 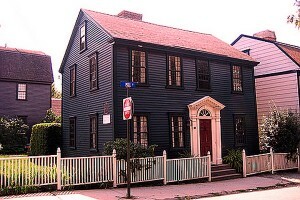 Thus it is a house with no gables or other vertical sides to the roof. 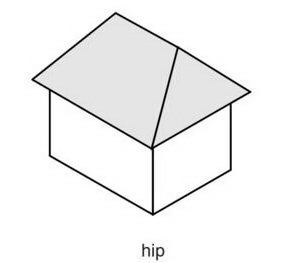 A square hip roof is shaped like a pyramid. 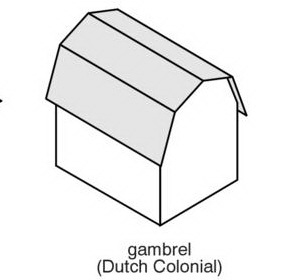 A gambrel or gambrel roof is a usually symmetrical two-sided roof with two slopes on each side. The upper slope is positioned at a shallow angle, while the lower slope is steep. 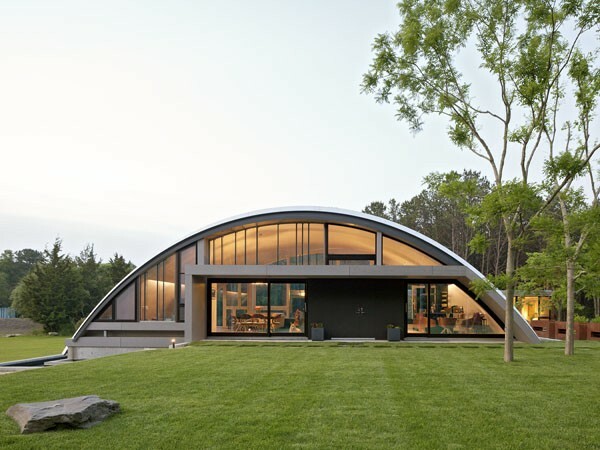 This design provides the advantages of a sloped roof while maximizing headroom inside the building's upper level and shortening what would otherwise be a tall roof. 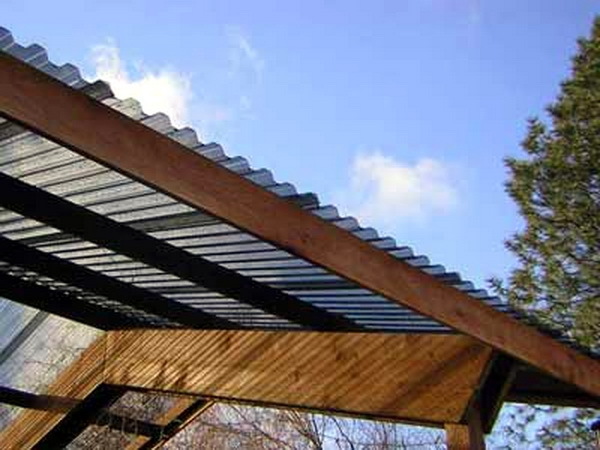 Sometimes also referred to as Lean-To Roof, Pent Roof or Skillion Roof, Shed Roof is a sloping roof surface, often not attached to another roof surface. The last few types are really speaking for themselves and are not very common in residential construction in Canada. 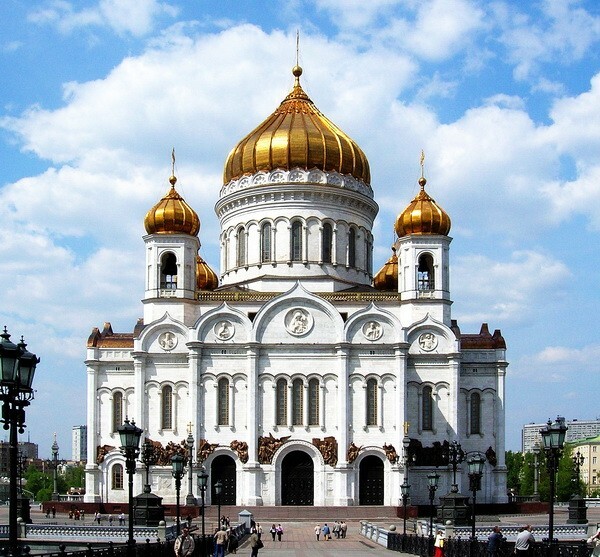 This is the Moscow Cathedral of Christ the Savior Domed roofs are very typical for the Orthodox Churches. 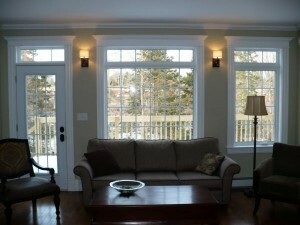 Windows are the eyes of the house, they provide for natural light, ventilation and, of course, beautiful view. Windows changed and developed over time from a simple "hole in the wall" to the state of art, energy efficient, multi-functional modern windows. Well, lets have a look at some types and categories. 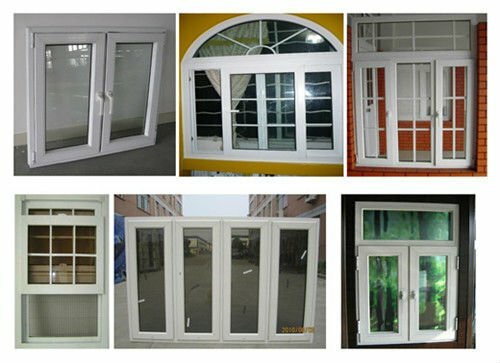 There is a large amount of sources listing and describing different types of windows, but I did not come across any logical system, will try to sort them out myself. 2. 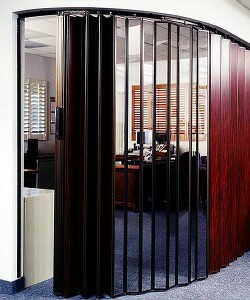 Operable or opening or moving. 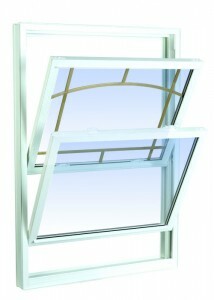 Used for the light, view and ventilation. All operable windows can swing (casement window), slide (slider) or do a combination of the moves (tilt and slide / tilt and turn). Lets look at each type at a time. 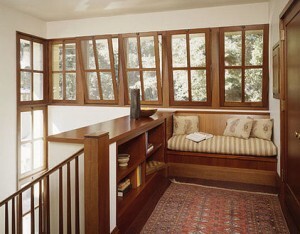 An extra-large window that provides a broad outside view and lets in a lot of light. 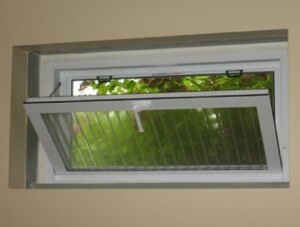 Picture windows are usually fixed, non-opening (inoperable) windows. 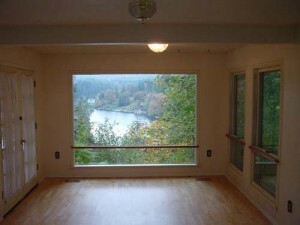 Often single paned and typically do not contain any glazing bars which may mar the fabulous view. 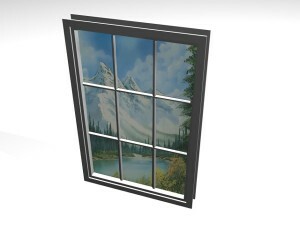 They are called “picture” windows because the large window is intended to provide a wide view of the outdoors, similar to a picture frame. 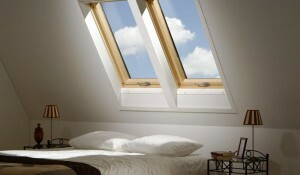 Also called clearstory, clearstorey, or overstorey, are any high windows above eye level. The purpose is to bring outside light, fresh air, or both into the inner space. Clerestory windows are often fixed. 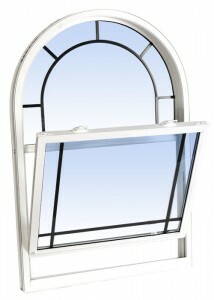 A window above a door or an operable window. In an exterior door the transom window is often fixed, in an interior door it can open either by hinges at top or bottom, or rotate on hinges. It provided ventilation before forced air heating and cooling. 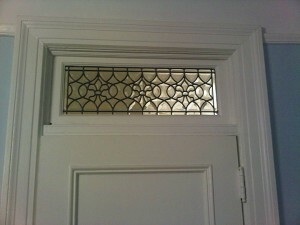 A fan-shaped transom is known as a fanlight, especially in the British Isles. 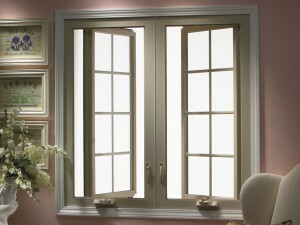 A casement window (or casement) is a window that is attached to its frame by one or more hinges. Casement windows are hinged at the side. The panel (sash) opens by turning a crank on the hinged side, and the sash swings either in or out. 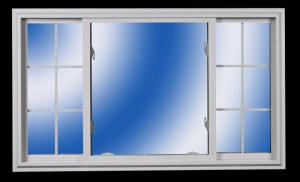 Casement window may be top-hung, bottom-hung or side-hung. 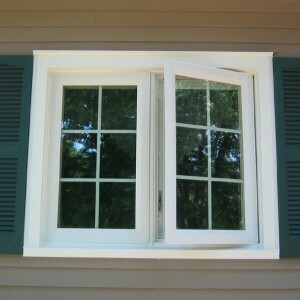 Casement windows may be single or double. 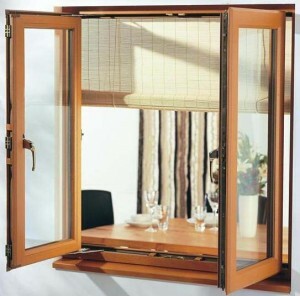 Casement window hinged at the top is referred to as awning window. The panel (sash) swings outward. 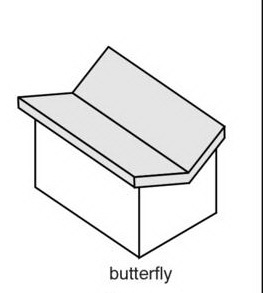 When opened, the shape resembles an awning, hence its name. 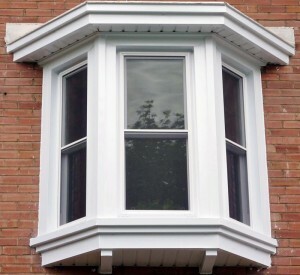 Traditional awning windows are often found on older buildings and can lend charm and character. 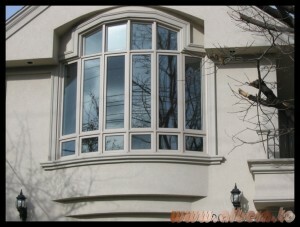 Casement window hinged at the bottom is referred to as hopper window. Another casement. 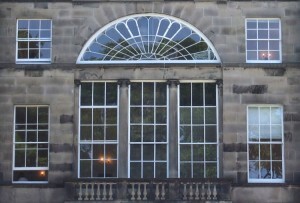 A pair of 2 panels (sashes) hinged on the right and left sides of the window, and both panels open to the middle. 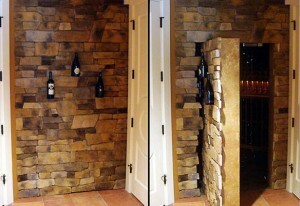 This creates a “French door” effect. The window is latched in the middle. May have a lattice pattern. 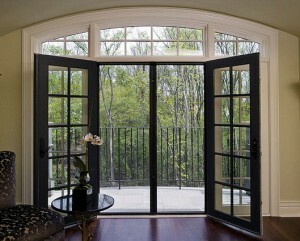 Sometimes a French door that overlooks a patio or terrace is referred to as a French window. These windows have sash that slide horizontally. Single sliders have one fixed sash, while double sliders have two movable sash. 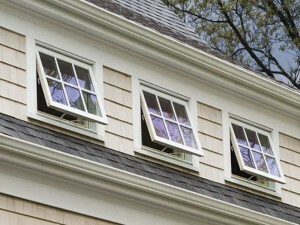 Most horizontal sliders have at least one removable sash. 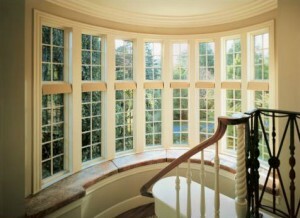 A single hung window is a vertical slider in which the top pane of glass is fixed and the bottom sash moves. In some designs, the sash tilts in for ease of cleaning. Double hung windows are similar to single hung windows, except that both sash move and are controlled by a balancing mechanism so the sash do not fall down when raised. Bow windows have more than three sections set at gentle angles (usually 10 degrees) that give the window a curved appearance (like a bow). 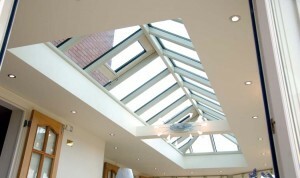 A roof lantern is a multi-paned glass structure, resembling a small building, built on a roof for day or moon light. 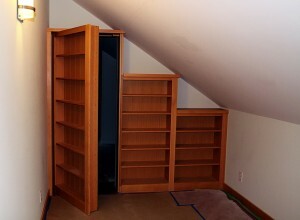 Sometimes includes an additional clerestory. 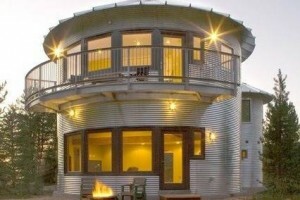 May also be called a cupola. So many types and kinds, and I only listed the most widely used... Just keep in mind - windows will only be the real "eyes" of your house when they are sparkling clean! Your rights as a Tenant are protected by Residential Tenancies Act (2006). There are quite a few interesting provisions on the act that landlords often "mysteriously forget" to mention when signing lease agreement. Here are some that most Tenants are not aware of. 1. Tenant is not required to provide a landlord with postdated cheques or agree to automatic debit payments from the account. Landlord is allowed to ask for the cheques, and tenant might agree, but does not HAVE TO! 2. "NO PET" provision is unenforceable for most rental properties (condominiums with "no pet" provision included in a declaration would be exempted). The landlord may make an application for an order to terminate the tenancy and evict the tenant under some circumstances - where animals cause serious allergic reaction, substantially interfere with the reasonable enjoyment of the property by other tenants or when animal is inherently dangerous. In other words - you can keep your pet, unless it is a cobra, or it barks its head off whole night. Tenant will also be responsible for any damage caused by the pets. The monthly rent of an apartment is $800 beginning August 1, 2012. With proper written 90 days notice to the tenant, the landlord could lawfully increase the rent 12 months later on August 1, 2013. The guideline for 2013 is 2.5 per cent. The rent increase is 2.5 per cent of $800 = $20.00. 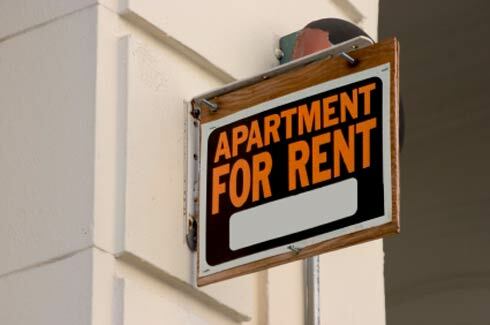 The landlord MUST give at least 90 days notice on an approved form for any rent increase. 4. A rent deposit cannot be more than the lesser of the amount of rent for one rental period or one month. It is commonly referred to as last month rent. 5. Landlord is NOT allowed to request any security deposits. Wishing you well deserved reasonable enjoyment of your property! You won't see those too often in Toronto. 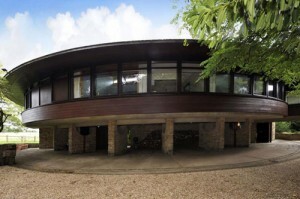 These homes were originally built with bricks made of tightly compacted earth. These houses borrow architectural details from the earthen homes of early Native Americans and feature massive, round-edge walls, flat roofs, stepped levels, heavy timbers extending through the walls to support the roof, deep window and door openings and simple windows. They often feature a corner beehive fireplace, benches that are attached to the walls, niches for display of religious items, heavy wooden doors and enclosed courtyards. 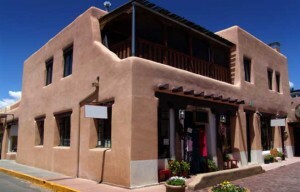 They are most popular in the southwestern United States and are also called Santa Fe or Adobe houses. 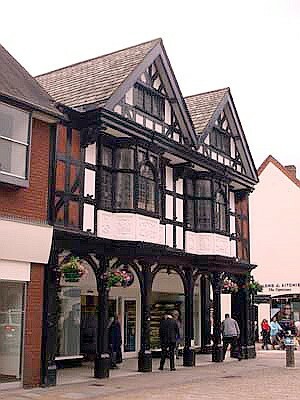 This wood-frame style can be identified by its rectangle shaped house, 2 rooms deep and 2 stories high. 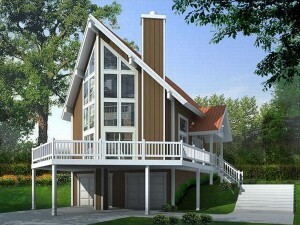 It can be recognized by its long lop-sided roof, flat front, and chimney centrally placed. 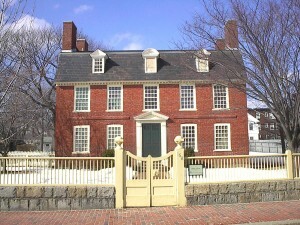 With symmetrical sides and noted for its elongated roof that slopes down the back, this classic eastern style is the basis for many other architectural styles, including Cape Cod, Federal, Georgian, and Plantation. It was most popular from 1800 to the 1920’s. 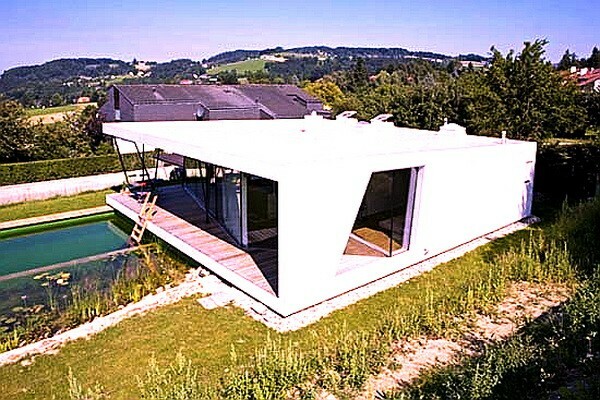 I am not a big Feng-Shui expert, but this type of home must be perfect from their stand point - no corners, none at all. 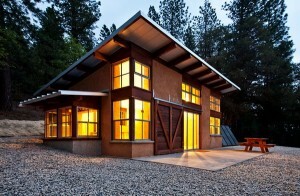 These homes would also be energy efficient and eco-friendly. 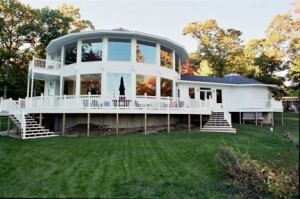 Circular styles are known for withstanding tornados and hurricanes because their design offers protection against the harsh elements. 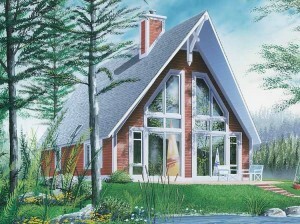 They are ideally suited for country living where views abound, with large windows boasting panoramic views.